Small in size but huge in ability, this bright little IP65 rated gem is loaded with quality components and top-notch features. 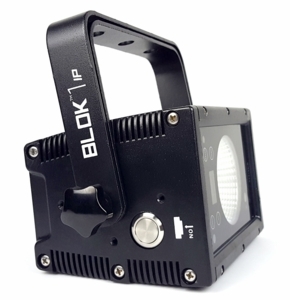 Blok 1™ IP fixtures come fitted with a single high-output 25W RGBAW 5-in-1 COB LED with a 30° beam angle, plus, it goes anywhere light is needed thanks to its internal Intelion™ lithium-ion battery system. The battery can easily last 10+ hours per charge with normal use, or even 2.5 hours at full light output. Blok 1™ IP fixtures come with a built-in wireless AnyFi™ receiver that supports W-DMX™ and our own Skywire™ 2.4Ghz wireless DMX protocol, so it can receive wireless DMX from any Blizzard transmitter such as our wiCICLE™ and Lightcater™ products. The fixture has no fans due to its solidly constructed cast aluminum housing with heat sink that naturally dissipates any heat. It also has a tempered glass lens and watertight internal gaskets, which protect the light source, antenna, status LEDs, and the easy-to-use Micro OLED control panel with 4 touch sensitive electronic buttons.